Quinoa is a grain that is perfect for a gluten free diet; however it's very bland by itself. We had a very dear friend over for lunch this weekend and she is allergic to gluten, so I was determined to figure out a satisfying way to prepare quinoa. I ended up flavoring it with parsley and a medley of vegetables and seasonings such as corn, artichokes, eggplant, button mushrooms, sun-dried tomatoes, French green beans, capers, bell peppers and gorgonzola. This allows the quinoa to act as a palette for the other flavors. I served it in a large bowl for brunch, but I also set some aside for something a little more special. I placed mounds of the quinoa on gluten free crackers. 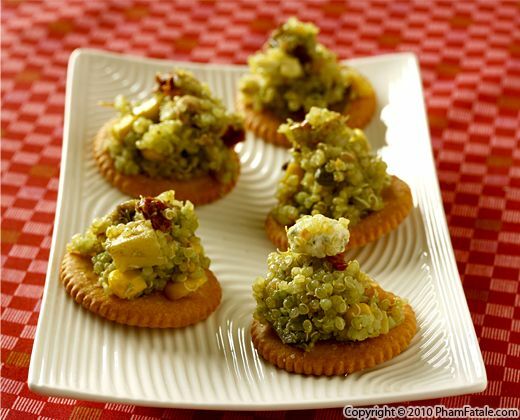 The result is a fancy, tasty and unique vegetarian, gluten free appetizer that everyone can enjoy.